Kevin Costner and his band narrowly avoided serious injury when a Canadian concert stage collapsed during a storm, killing 1 and injuring 75. 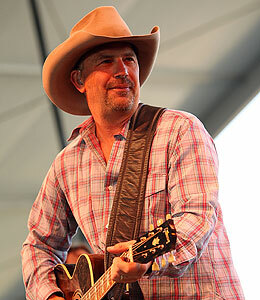 Costner and his band, Modern West, were prepping to take the stage at the Big Valley Jamboree festival in Camrose, Alberta, Canada, when a deadly thunderstorm caused the stage to collapse. Costner and his manager were trapped underneath the stage when it caved in, but were able to crawl out and escape without injury. The actor and his band released a statement regarding the incident. It reads: "We are so sad about the loss of life and injury that occurred on a day that carried so much promise, but turned so wicked so quickly. We hope to return to Alberta in the future to help with the healing."